There are two and a half doctors for every drug representative. Story: He disqualified himself as a geek by asking a question about law at a geek conference. Question: Is government just stupid? The government often gets the easy cases wrong. Such as. There is a consensus among public policy makers that any copyright term change should be prospective only. But governments always extend terms. An easy case the gov gets wrong. Nutrition… The sugar lobby urged the government to get the Food Nutrition Board to say no more than 25% of your caloric intake from sugar, while the WHO said 10%. Global warming… There is a consensus that it’s real and we need to work on it. 1000 peer reviewed articles over a period of time. None disagreed. But junk science did, and the government, by doing as little as possible, got it wrong. This leeds geeks to a position of hopelessness and disengagement. Most think government is a waste of time. The problem is not stupidity. The system of influence by lobbyists and campaign fundraising that radically effects access, attention and understanding, weakening the government’s ability to get it right. If money distorts, then pubic financing of elections would stop it. That’s one of Lessig’s theses. He also thinks the right should like public financing because it would result in smaller geovernment. Many on the right were against deregulating cablecos and telcos because deregulating them would remove them as sources of campaign financing. So. Need a netroots campaign that is not DC centered. That’s why Creative Commons was born. Change Congress wants a simple way for citizens to signal what they want. Next is wikified tools for an army of collaborators to suss out who is for reform. Fund reform after that. Take the problem you’re trying to solve, and make it manageable, digestable and segmentable. These aren’t new ideas. Just a new opportunity. Argument: Only if the outside makes a demand will the inside change. Bribery in congress was not illegal until 1853. Jefferson expected expected bribery to win. The top 1% protect themselves from the bottom 99%. “We do nothing as this happens.” This is exactly what Larry said to the geeks in his first Free Culture speech, by the way. Criticism: people care more about substance rather than process. Comparing the current problem to alcoholism. It’s the first problem. We can address no problems sensibly until we face this first problem. Until we change congress. People tell them they’re happy about this project, but that he will fail. Yet even certain failure teaches. It’s not excuse not to do something. We, the most wealthy, secure and articulate people in this polity must be the first to work on this. These corruptions are promulgated by the most privileged. Now he’s asking us to “join me here.” The moment is straight out of Billy Graham. We should recall the success of the technique. Rep. Graham is for Senator Obama, by the way. No surprise there. 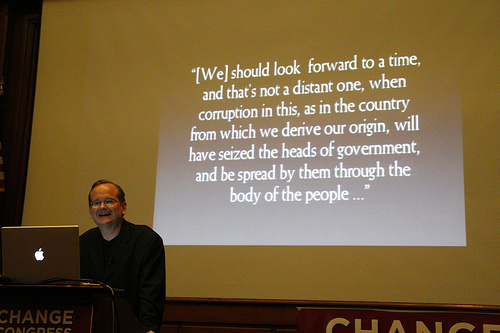 A main point of Lessig’s is that Change is more than a slogan. It’s not an empty phrase or a campaign slogan. Lessig again: Congresspeople spend hours a day telemarketing. Looking for money. “Congresspeople have an extraordinary job… they get to do the right thing.” Geeks need to push them to do this. It’s still early. No board. No structure yet. Note to selves: a lot of what Larry wants here is what Britt Blaser and friends are working on. By the way, Larry will be speaking a week from today, at noon, at UCSB’s Multicultural Center Theater, courtesy of the Center for Information Technology and Society (with which I am also affiliated) there. I can’t recommend it too highly. Larry’s talks are a great show, as well as a call to commitment that’s likely to be as strong and appealing as any you’ll experience in your life. [Later…] Here’s a picture gallery from the talk. One of the recent podcasts I listened do brought up the point that Email has ZERO impact on a politician… because it’s NO cost to generate. The key to influence is to generate signals that are large and hard to fake. It used to be that a single letter was equivalent to 2000 votes… so actually writing in worked… now with all the astroturfing, and the rockstar economics of the big head (the opposite of the long tail).. there’s no effective way to signal that something needs to be fixed. I hope Lessig’s work has an impact, but like the others, I’m pretty sure it’ll fail. Climate change is real. Whether people caused it or not is immaterial. The question is, now that we know about it, what is the best plan? To try to freeze (or burn) the current climate in place? Many say “yes, of course!” But what if it’s cheaper to deal with the changes? Perhaps it would be better if politicians had to spend their own money to buy our votes? As it is, they’re spending OUR money (earmarks) to buy our votes, and I can’t see the sense in that. Make vote-selling legal and people will insist on cash in hand rather than some project they don’t care as much about. Currently the only people that copyright is actually working for are lawyers and Mickey Mouse. Folks keep forgetting the other part of the Copyright Bargain, that Being the Public Domain. Roll back copyright back to 14 years with one 14 year extension for the Authors only. Really. Repudiate WIPO, the rest of the international accords and reset it. Require Registration, with deposit, at a very low cost for closed ended works like novels, etc. This will put copyright and intellectual property lawyers on the curb, but they can watch our cars while we are shopping. Develop a ISBN scheme for open ended works like blogs. Change one simple rule on congressional and senatorial races. Contributions can only be given from the taxpayers in the states they are running. Corporate Donations can only be given if the corp. is headquartered in the state. The Copyright Bargain may have been built on a fallacy. Over at Techdirt, there has been a series of articles describing and explaining the results of peer-reviewed economic research that shows that patents and copyrights do not serve the purpose of advancing the arts and sciences, which is the justification (as opposed to the reason) for establishing them. The articles are pretty persuasive, though I haven’t gone to check the research cited to see whether it is accurately represented. So, while rolling back copyright terms to 1950 probably would be an improvement, eliminating copyright altogether probably would be even better, as well as being a whole lot more harmonious with modern technology. But neither of those changes are likely in the current political system, so it is pretty pointless to spend much energy on them until the political system is corrected. Getting it to correct itself, working within the system, will be an extremely difficult task. If Lessig can put together an approach that does that, he will deserve all the praise that anyone could give him. But I wonder. Suppose the whole notion of democratic government is built on a fallacy, just as copyrights and patents are (or at least may be)? Perhaps democracy works pretty well in small communities, but human nature just makes it silly to rely on it for running cities, states, and nations. I’m a techie; I’ve never paid much attention to politics and government. I’ve heard of people studying something called Political Science, but I’ve never investigated what that is, exactly. So it might be that the idea that democracies are built on a fallacy is an old idea, well-studied and discredited. I don’t know. But looking around at past and present experience around the world, it doesn’t seem to be working very well, or at least not as well as many ordinary people think it ought. Yes, I’m aware of the saying that democracy is the worst form of government, except for all the others. I think I understand what that means. But I wonder whether there is another form that we just haven’t thought of yet. I don’t have an answer, just the question. My feeling is that constructive contribution to maximum useful effect is the best policy for everything from marriage to writing code. That’s what open source is, essentially. I think it will work for governance as well. We can call it democracy, but it’s not necessarily majoritarian, any more than code production is majoritarian. I don’t have this thought out either. I am sure, however, that the presence of the Net in the world, with its contribution-threshold-lowering qualities, has changed the conditions in which we live, if not also many of the rules. I think the jury is in on the subject of Global Warming. One needs only recognize that the Great Lakes are barely older than the Pyramids. The topography where Russ and I both live (upstate New York and Boston, resepectively) was abandoned by the glaciers that shaped it, in what is essentially the geologic present. In other words, glaciers have been in retreat, and seas have risen, almost steadily, ever since the last ice sheet finished depositing Cape Cod and Long Island about 20,000 years ago. They will continue until they stop in the next few hundred to few thousand years, and then return to buldoze everything, including civilization, back into Dixie, a few thousand years after that. There is no sign, Global Warming withstanding, that these cycles will stop. There is also no doubt that human wastage has contributed to the current warming trend, bringing the inevitable a good bit closer to happening. What we can do to stop or reverse it invites countless answers, none sure to work. The catastrophe about to be visited on the planet is non-trivial in the extreme, and we should do our best to address it realistically. That is, we should be prepared to sacrifice our own conveniences for those that maximize the continued abundant variety of nature, of which we are but a subordinate part. Won’t be easy. Might be impossible. But it would be the height of hubris, by the creature that invented rationalization, to believe (a) that we are entirely responsible for what nature has been doing for dozens of thousands of years already, (b) that we are equally able to reverse it, and (c) that our main job is to preserve ourselves and civilization as we know it. Because all three are wrong, even if we are right that Global Warming is happening. Doc : on democracy being something works on the micro, maybe, just maybe on the meso scale, likely not on the mega or meta scale. Trouble is – people lie, so polls fail. I find myself all but ignoring National, often even State politics as there is virtually no addressing true issue, just selling soap, pandering for votes. Local on the other hand seems to work. I serve on boards, try to adjust my schedule to attend town meetings, talk to elected neighbors, sometimes share a sandwich or beer with elected officials. At this level, you can build communication, maybe even a bit of “trust” and try to get things done. Somewhere between town and county, moving up towards state offices, the chain weakens, eventually fails. In Michigan we went to “term limits” and ended up with the only ones who knew how to run things are the lobbyists. Other : great comment on the hubris of climate change. Some change may indeed be anthropogenic but there is also a political agenda on the part of some. Did the life forms that evolved oxyphotosynthesis say “whoops” there goes the neighborhood? ‘To promote the progress of science and useful arts, by securing for limited times to authors and inventors the exclusive right to their respective writings and discoveries” which is where you probably brought the patent into the mix. Your assumption of the fallacy has merit as copyright has been gutted in terms of not requiring deposit and registration which was removed in 1976. Eliminating copyright entirely is a foolish notion from a societal standpoint, as even back then the founders recognized that not every useful act in society involved looking at the backend of a mule in a field, nor as middleman with a store. Consider that your ability to engage in discussion is a direct result of being educated by folks who wrote books and the folks who used them to teach you the basics of communication. But hey, if you feel that authors and artists should not be compensated because it is not ‘real’ work/production, by all means, adopt one or two and pay their bills. Harmonious with modern technology? Good Grief! talk about your right click, save as mentality. We can stop creating, which will over time eliminate all those pesky intellectual property lawsuits, but ask yourself, do you really, really think that we have reached our peak as a civilization, regardless of whether or not current democracy is better than the alternatives? Copyright is an anachronism and, long past being ripe for abolition, it is now rotten for it. We have the Caxton and Luddite faithful on the one side, and on the other, the technicians of the instantaneous diffusion device we call The Internet. Unfortunately, we have a silent schism between these two sides. Those who already recognise how completely ridiculous a legal constraint against unauthorised reproduction or distribution is in the digital domain pay no mind to it. Whereas those who’ve been educated to respect our last three centuries of authorial myth and legend, regard copyright as the essential bulwark of humanity’s cultural survival. Heliocentricity or not, that is the question. Copyright is either an unethical mercantile privilege, or it is a natural human right. Will mankind’s culture really come to an end if our cultural liberty is no longer suspended to provide a commercially lucrative privilege to printers? Perhaps copyright is a three hundred year long crime against culture? And what of patents? These regal boons to suspend the poeple’s liberty that should never have outlasted the monarchies that fashioned them, should shock any nation that believes itself emancipated and yet finds itself still subject to them. Have you read the articles over at Techdirt that I mentioned? If not, you might find some interesting things there. I am well aware of Article 1, section 8. The fallacy I’m referring to is the assumption that that section was based on. The assumption that patents and copyrights do promote progress. The articles at Techdirt have pointed out that some of the founders were rather dubious about the wisdom of including that provision. I encourage you to read those articles. They are very interesting, for more than just that one point. It will be interesting to see how Obama works to resolve the current problems of this world, the economy and the climate changes. May God bless us.